The NEX-F3 is one of three Sony mirrorless camera models released in 2012, and it’s the company’s eighth since the launch of the NEX line in 2010. The NEX-F3 borrows heavily from higher-end models, but also taps much of the technology found in its predecessor. So is there any big evolution in sensor quality for the NEX-F3? Or were most of the changes to the camera cosmetic? DxOMark has some answers. Olympus caused a sensation when it revived the legendary OM line that had enjoyed its heyday in the silver halide era. The Olympus OM-D E-M5 successfully revisits the OM design in terms of its ergonomics and workmanship. Olympus has quite precisely taken advantage of this new family in its line of compact hybrid micro 4:3 cameras to introduce a new 16 Mpix Live MOS sensor. What is this new sensor all about? Does it represent an improvement over current Pen sensors? 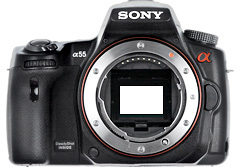 Does it help the micro 4:3 category to catch up with the APS-C hybrids (with the Sony NEX in the lead)? Our sensor review provides the answers. Today, Sony announced the SLT Alpha 57. This new model replaces the one and a half years old SLT A55 translucent mirror DSLR. comes with some interesting improvements in particular for its continuous shooting and auto focus. When the Sony A77 was announced a couple of weeks ago as a replacement for the Sony Alpha 700, Sony’s semi-professional APS-C camera, we were all very impressed by its specifications. So we were really excited to see how it would perform in our tests. The EOS 600D looks much like the EOS 550D, which, however, it does not replace. Both bodies will remain in Canon’s lineup. The 600D utilizes most of the 550D’s hardware features, including its 18-megapixel sensor; it adds an articulated screen, along with the “beginners” functions and creative filters first seen on the EOS 60D. In a way, the EOS 600D results from the fusion of the EOS 550D and the EOS 60D. DxOMark review for APS-C camera 2010 : who takes the lead ?